This musical is based on the New Testament stories about a small family that often welcomed Jesus into their home. 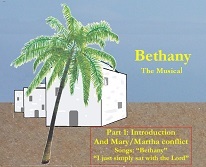 The musical was designed for low-budget performance in intimate settings that enable the audience to be part of the action. The setting is a party in the family home, when they retell their experiences in brief sketches. There's just one problem - the audience has arrived before the room is set up! The first ever performance was at St Michael's Church, Stoke Gifford (just outside Bristol). The event was filmed and, for many years, only available on DVD. Now it can be viewed, in 5 episodes, free on You Tube. Follow the links below to go directly to each episode.